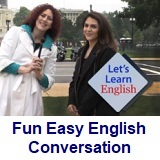 ﻿ Fun Easy English - new classroom free online classes english language lessons speaking listening writing reading march 15. 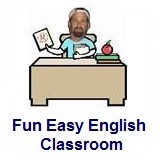 Today in the Fun Easy English classroom you are going to write the English alphabet letter E in manuscript and cursive. 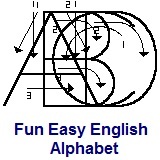 Writing the English alphabet letter E correctly in manuscript and cursive. This letter is pretty easy to write but kids often write it backwards. In this lesson Sue tries to teach Anna how to turn trash into treasure. But Anna doesn't seem to know what treasure is. And she makes a big mess. “Read the instructions carefully.” She told Anna to read the instructions carefully.